The Park Hotel, later named Hotel Raleigh, was built in 1893 at 138 West Martin Street. It was designed by the enigmatic A.G. Bauer, who also designed the Governor’s Mansion and the old Meredith College building downtown. The hotel thrived during the era when most people traveled by train. Located a block away from Union Station, it proved a convenient resting place for those traveling between New York and Florida. As the car began to replace the locomotive as America’s primary means of long distance travel, hotels and motels popped up along highways and interstates. This caused the centrally located hotels to go into decline. 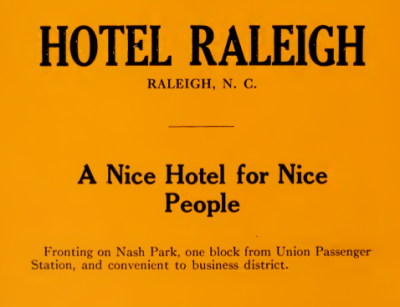 By the late 1960s and early 70s, most of Raleigh’s downtown hotels were shuttered. This isn’t the hotel we’re staying at but we are staying here for the night. Have made 723 miles so far. All feeling fine. We are quite tired when night comes. Hope you are getting along fine. The hotel underwent a series of changes in the early part of its life. It was remodeled several times and operated under different policies regarding long term and short term guests. 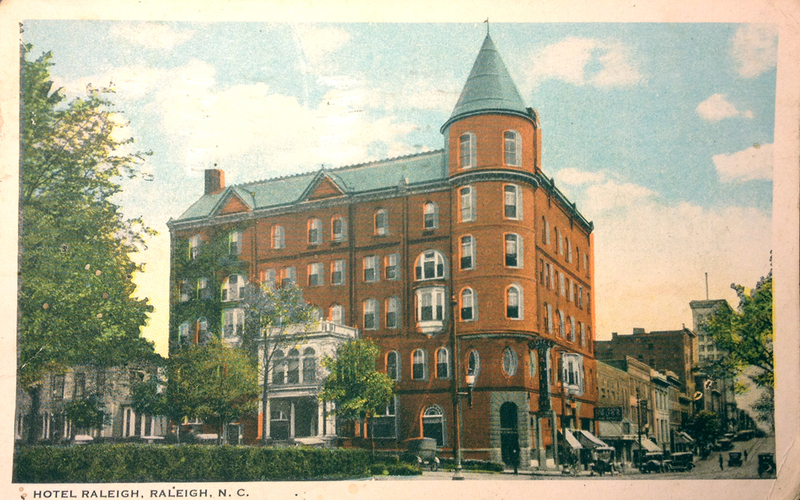 In 1912, it became Raleigh’s first apartment building after another conversion and remodeling. It was known as Park Central in the 1960s when it again operated as a hotel. It was demolished to make way for a surface parking lot in 1975. 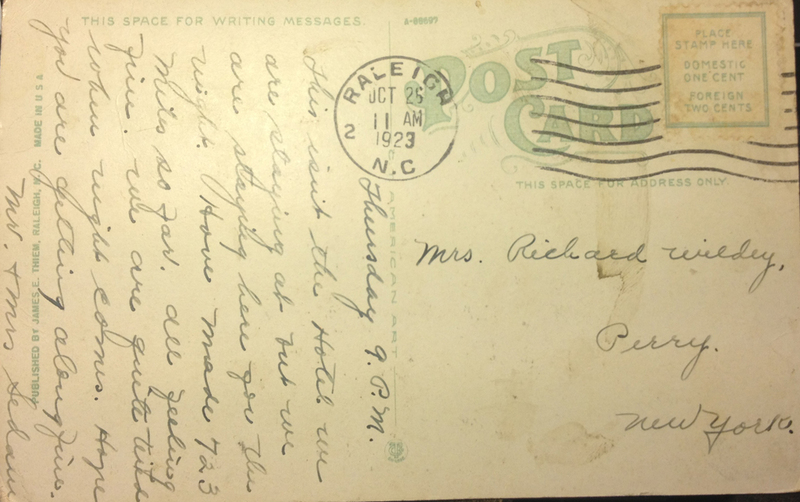 This postcard was published by James E. Thiem here in Raleigh. The Thiem family owned a number of downtown businesses in the early and middle part of the last century. One of the surviving remnants of the Thiem family businesses is a mosaic entryway adjacent to the Raleigh Times. 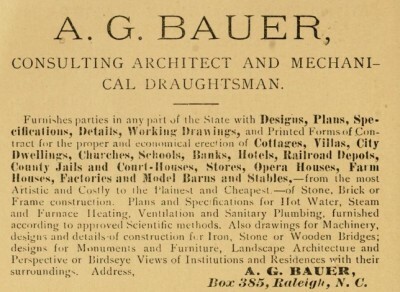 Above is a city directory advertisement for A.G. Bauer’s architectural firm. Below is an advertisement for the hotel. Ugh, I liked all of this post until I got to “It was demolished to make way for a surface parking lot in 1975.” Boo. Keep up the great work GNR! Y’all are killing it. I second the Flashback Fridays sentiment. I look forward it. I always like this building. I think turrets and towers are neat in buildings, but then again, I guess I have a medieval streak in me. I was sad when I saw it torn down in my senior year of high school. 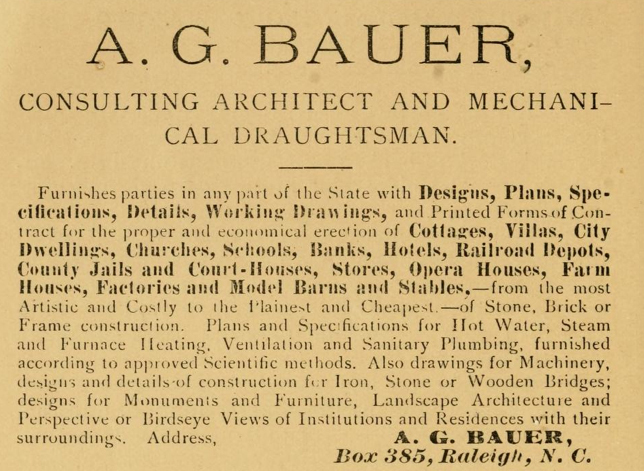 Raleigh has destroyed a lot of its history in its attempt to be a “modern” city. The N&O was responsible for the Park Hotel’s demolition. They also took down the old Andrew Johnson Hotel (built 1909) at the corner of Martin and Salisbury and replaced it with that ugly bunker that stands there today. All this demo was a part of the N&O’s downtown expansion of its physical plant in the mid 1970s when it was still a viable newspaper. For those interested, we have a postcard of the Andrew Johnson Hotel in the GNR collection, and will publish it (and its story) in a future post. I just found this post while looking at your post from today (10/10/2014). 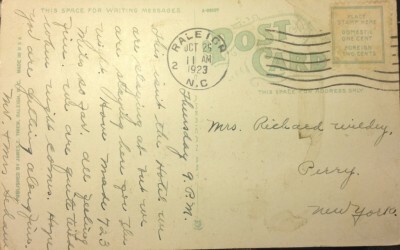 Thanks again for keeping Raleigh’s history relevant.